IPv6 Is Making The Rounds Are You Ready? That’s an IPv6 address. Really weird looking i must say. I did a little digging and came up with this website test-ipv6.com where you can test your ISP and browser for IPv6 compatibility. Check out the FAQ page that explains a lot about this new Internet Protocol. Wikipedia has this IPv6 Info: Internet Protocol version 6 (IPv6) is the latest version of the Internet Protocol (IP), the communications protocol that provides an identification and location system for computers on networks and routes traffic across the Internet. IPv6 was developed by the Internet Engineering Task Force (IETF) to deal with the long-anticipated problem of IPv4 address exhaustion. BTW: the below stats is generated by a WordPress plugin called Visitor Maps and Who’s Online, by Mike Challis. Here is the link to download it. Ive been using this program for several years and love it. 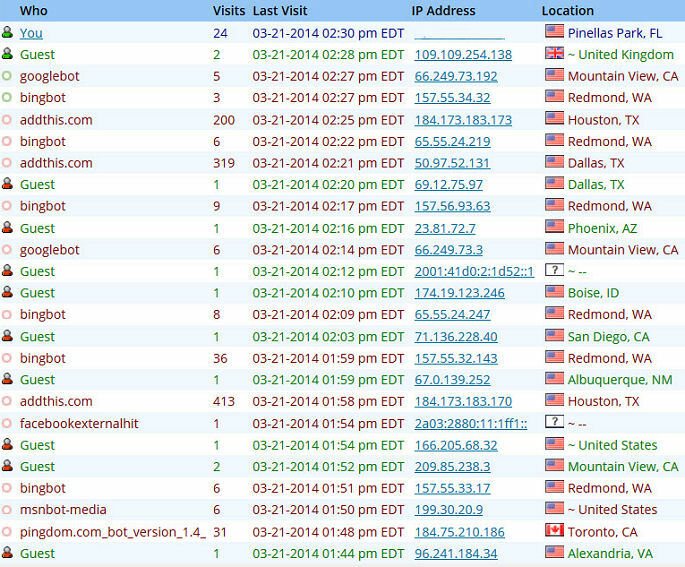 It’s great to quickly see who is visiting your website and do a whois lookup.